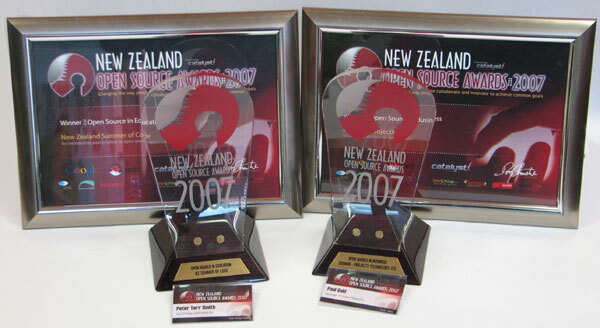 This came as a very pleasant surprise: In last night’s NZ Open Source Awards, ProjectX won the “Open Source Use in Business” category, and NZ Summer of Code took out the “Open Source Use in Education” award. We’ll write some more soon about the advantages we’ve found to using open source, and some specific software that we can’t do without; but for the moment we’re all just rather stunned! This entry was posted on Thursday, October 18th, 2007 at 9:18 am	and is filed under Business, New Zealand, News, ProjectX Technology, Summer of Code, Technology. You can follow any responses to this entry through the RSS 2.0 feed. You can leave a response, or trackback from your own site. Hey guys, congratulations on the wins! This is a big validation for your business and some much-deserved recognition for your efforts. Again, congrats! The Summer of Code blog has details on their win too.